Anybody know the output impedance of the waveform generator? I'm guessing 50 ohms but don't find it listed anywhere. The AWG (Waveform Generator) output impedance is zero Ohm on the Electronics Explorer, Analog Discovery 1 & 2. The Analog Discovery BNC Adapter Board has jumpers for AWG 0/50 Ohms and Scope AC/DC. I tried measuring the output impedance of the function generator by hooking it up to the scope with and without a 100Ω load resistor in parallel. The voltage drop indicated to me that the output impedance was around 16Ω, not 0Ω (which is not really very feasible). Of course, what I was probably measuring was the output current limitation of the AD8067 op amp (rated at 30mA for 60dB spurious-free dynamic range, or 105 mA short-circuit current). It is probably more useful to think of the output as a voltage source (0Ω impedance) with a current limit than as having an output impedance. With 100 Ohm load you are exceeding the 10mA output limit of the AWG. When the resistance is set too low for the maximum current rating of the AWG, the voltage will drop until the current is compliant, correct? Even though the voltage drops the “Use as Reference” being checked means that the signal would still show as if it wasn’t being attenuated which is causing the confusion. Is that right? Could you provide a screenshot of what happens when you uncheck that box? Of course, event with AWG zero Ohm output the voltage drops when the maximum current is reached. This current depends on the voltage level. The output voltage of traditional AWGs has a certain impedance, so the output voltage always drops relative to the added load. With the "BNC Adapter Board for AD" you can select similar 50 Ohm output impedance or you can put a series resistor when working with the wires. 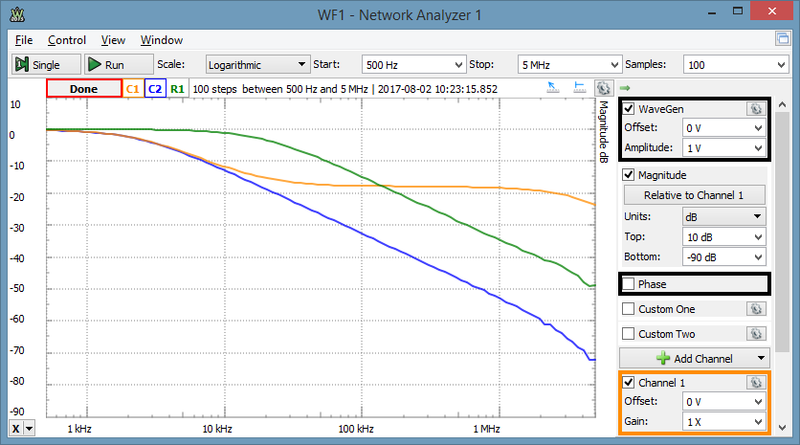 Having the "Use as Reference" selected under Channel 1 settings, only Channel 1 shows for Vpeak and Vrms the real value, for Gain and dB relative to the specified Amplitude. The magnitude shown for the other channels is relative to the measurement of Channel 1. This is done to show the characteristics of the analyzed filter circuit, eliminating possible Wavegen signal attenuations at high frequencies or excitation signal current limitations. This features is also useful to analyze sections of multistage filter, by connecting Scope Channel 1 to an intermediate section. In this experiment AWG1/C1 is attenuated. C2 shows the absolute value and R1 the relative value to C1.